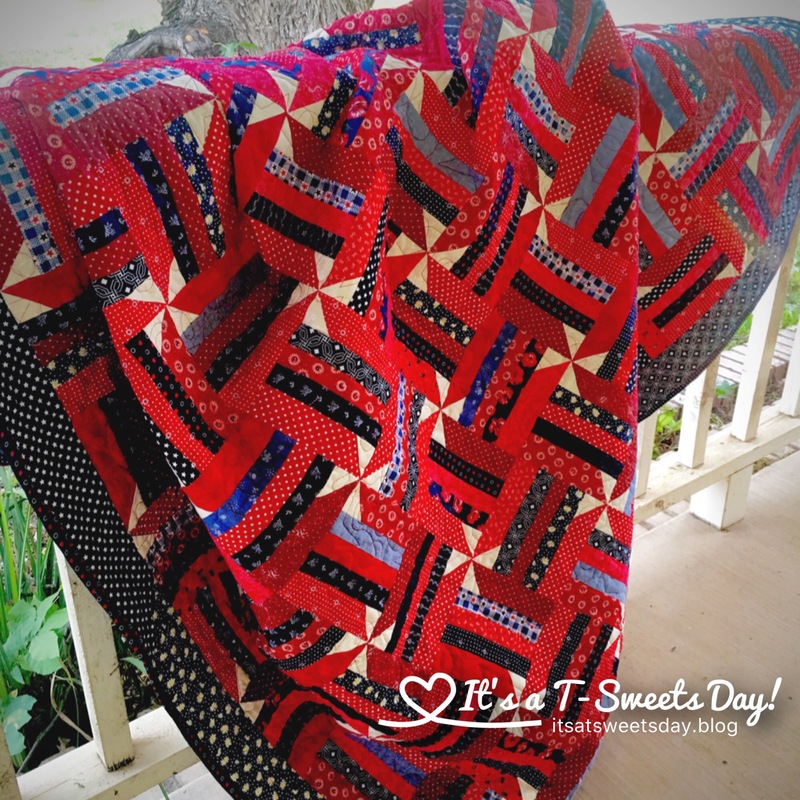 Learn to Quilt – Lesson 7 -Finish and Photo Shoot! – It's a T-Sweets day! 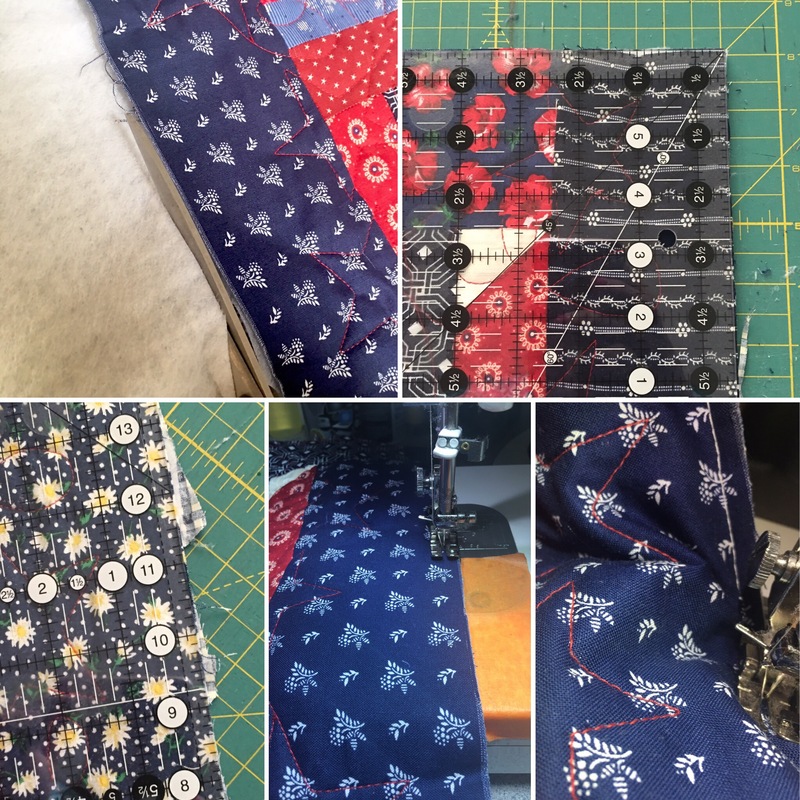 Learn to Quilt – Lesson 7 -Finish and Photo Shoot! 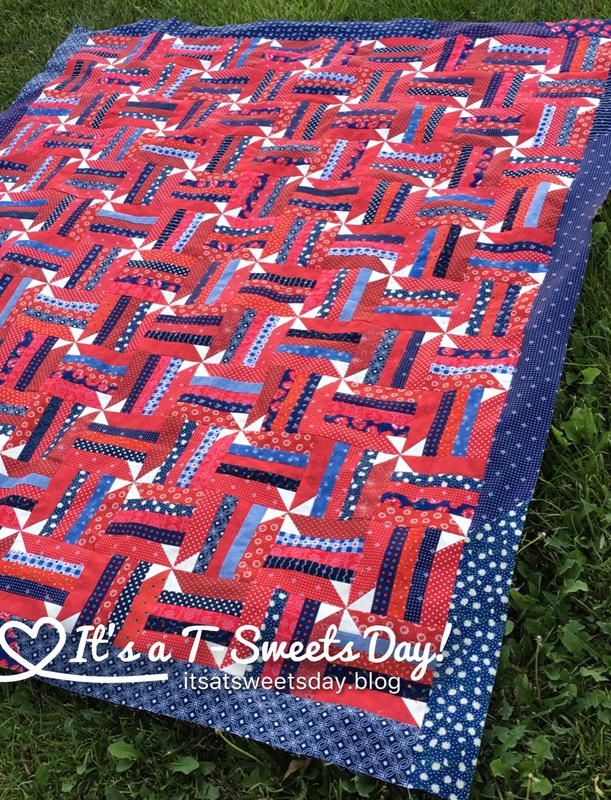 Published on June 29, 2017 June 29, 2017 by Tracy @ It's a T-Sweets Day! In our last lesson, we finished the borders all around out quilt top. It looks so pretty, but really, it isn’t a quilt yet. We need to prepare a back, gather our batting, sew it together, and bind it. Wow! There is a lot to a quilt! First, let’s talk about our backing. Your backing should measure at least 8″ wider and longer than your top. This is to make sure that it still covers the whole quilt after quilting. You can buy 108″ backing fabric at your local fabric store. Or you can piece together fabric until it large enough to be bigger than your top. This is my backing. 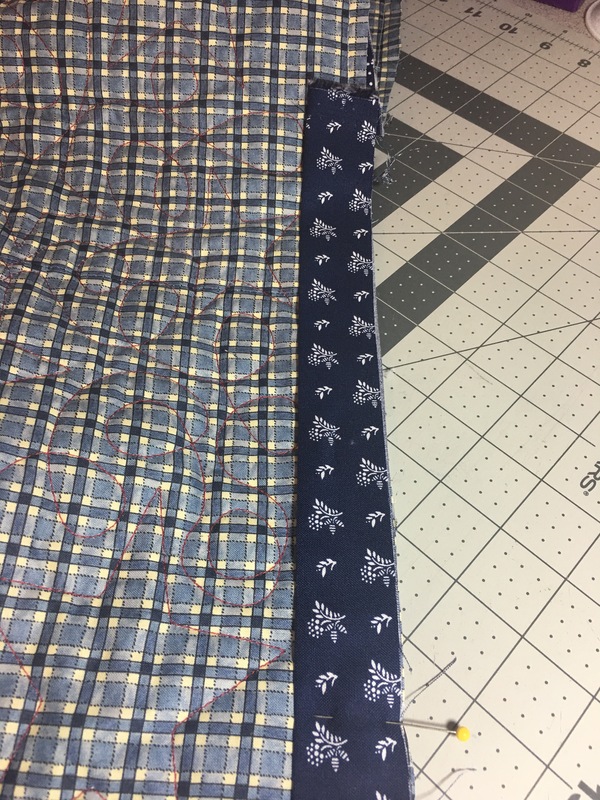 I didn’t have enough of the checked fabric in my stash so I added the stripe. I really like how it looks. Quilters make do! If you are using 42″ wide fabric, you will need to have 5 yards of fabric. Sew them together lengthwise making sure to cover the entire selvedge in your seam. 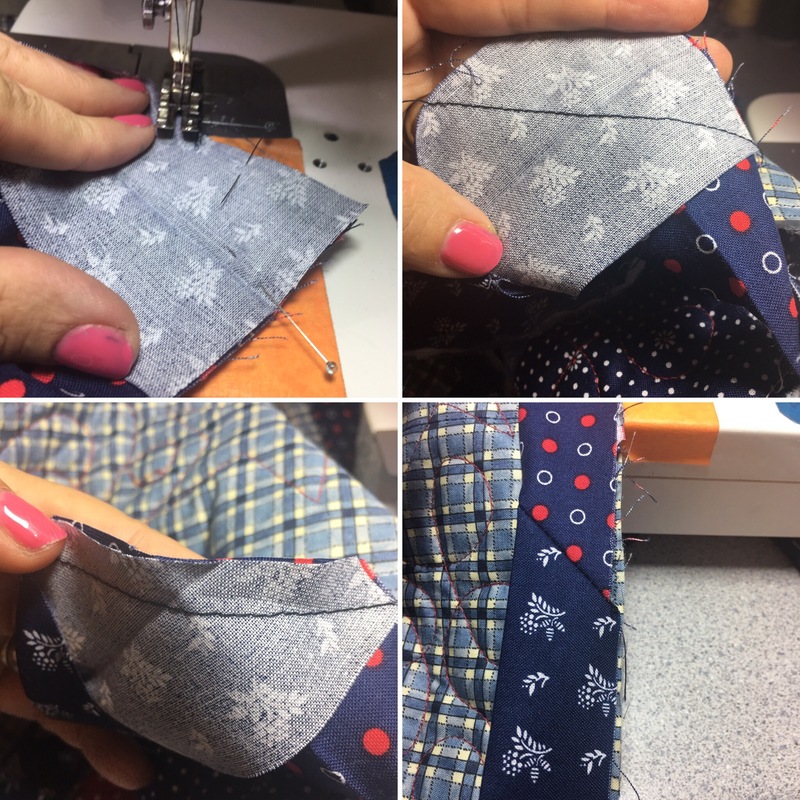 You will need to make a 5/8″ seam to do this instead of our normal 1/4″. Iron out all of the wrinkles and press your seam open. Now for the quilting. 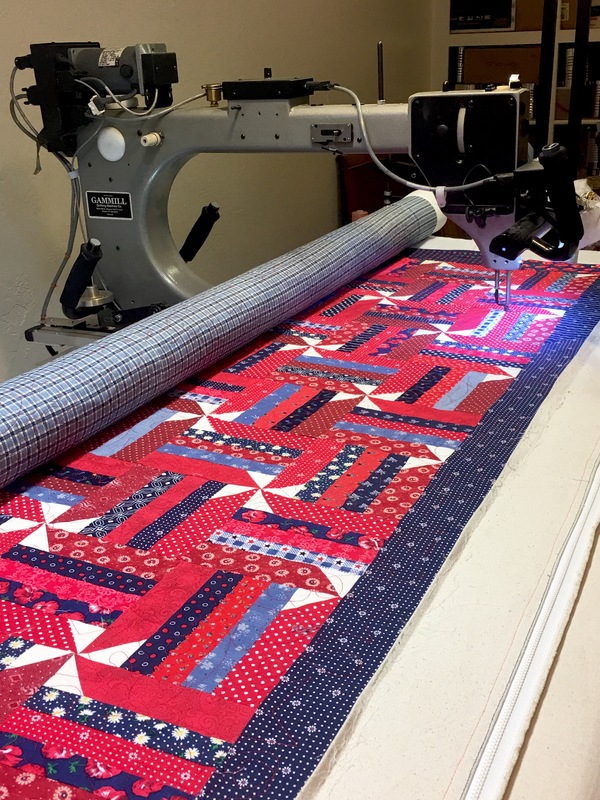 I highly, highly, highly recommend taking your beautiful quilt to a longarm quilter in your area and having them quilt it . 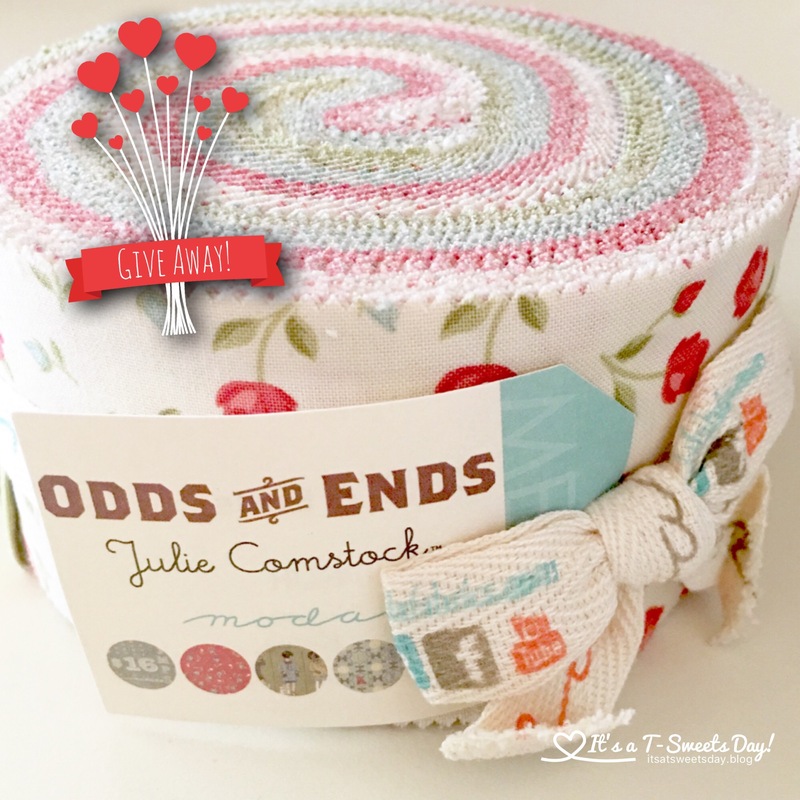 You will get a perfectly backed, fun stitched, no headache quilt in return. Once again, your local quilt shop can direct you to several quilters in your area. But if you want to save the money or the packing up of your stuff and heading to the store again, I get it, I have been there too:). Here is how you can quilt it at home. You are going to need a lot of safety pins or fabric spray glue. Lay your backing with the right side down or the wrong side facing up on a large hard surfaced floor. Lay the quilt top on top of the batting. Once again, spray the batting first if you are spray basting. 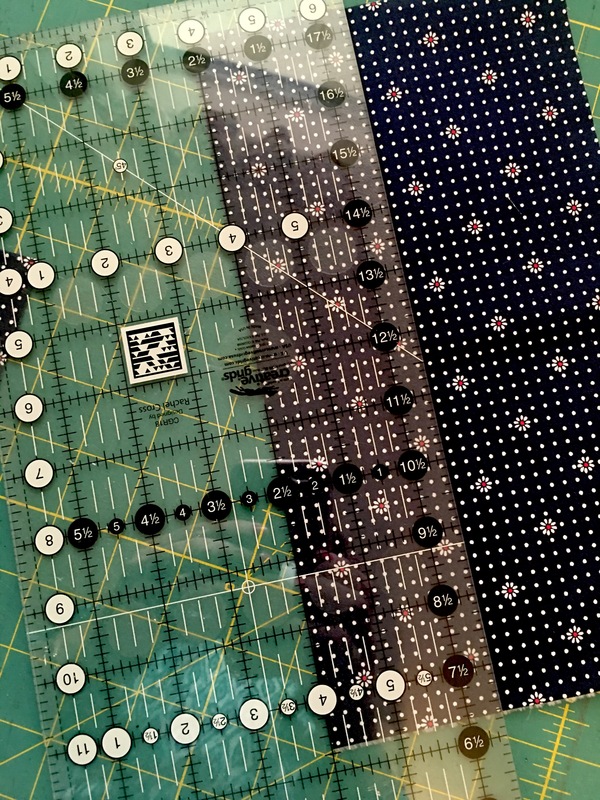 If you are pinning, now pin through all three layers at the center of every block. Repeat for all of the rows, go one direction, then other. Cut the batting and the backing even with the top. Use your ruler to square up the corners and straighten the edges. 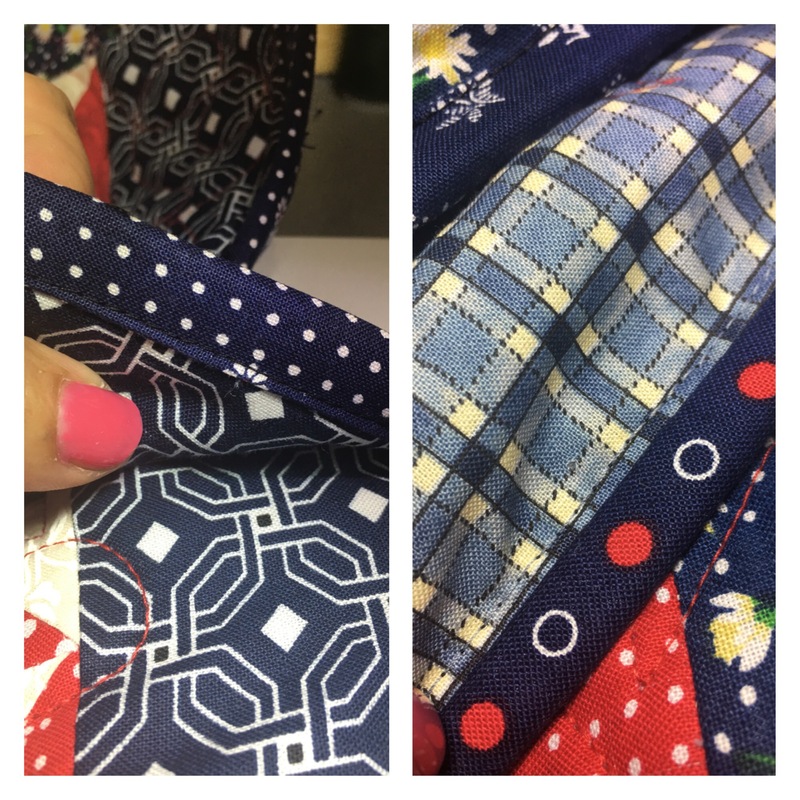 Sew 1/4″ all the way around your quilt to keep the edges together as we bind. 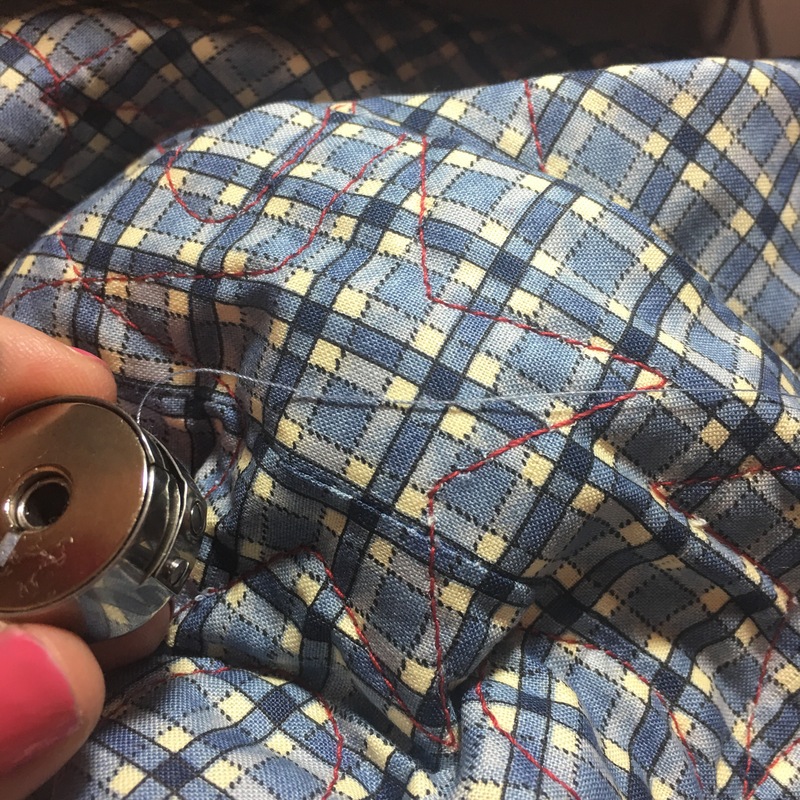 Nothing is more frustrating than a shifty bottomed quilt that doesn’t get caught in the binding. From the remaining blues or color #2, cut 8 strips 2.5″ wide. If you are using smaller lengths, you need 310″ or so. Take all of these strips to your machine. Place one strip horizontally on your table. Place a second strip on top going vertically. Be sure to match the edges. Sew from the top left corner to the bottom right corner. Use your masking tape from before as your sewing guide. Keep sewing them all together until you have one REALLY long 2.5″ strip. Press the seams open and cut off all of the little dog ear pieces hanging below the edges. 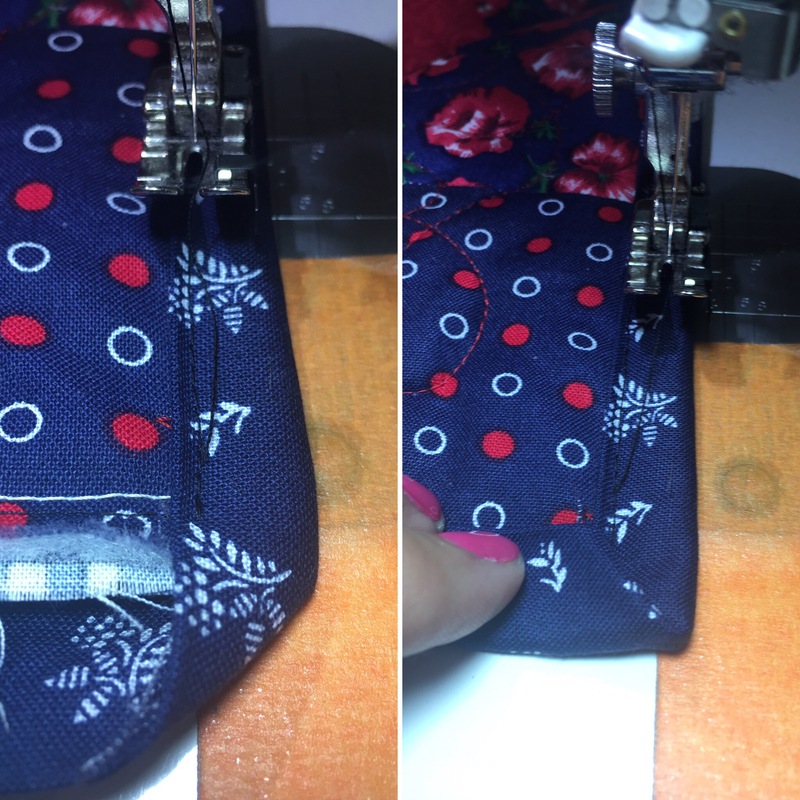 Starting sewing in the middle of a long edge on the back side of your quilt. 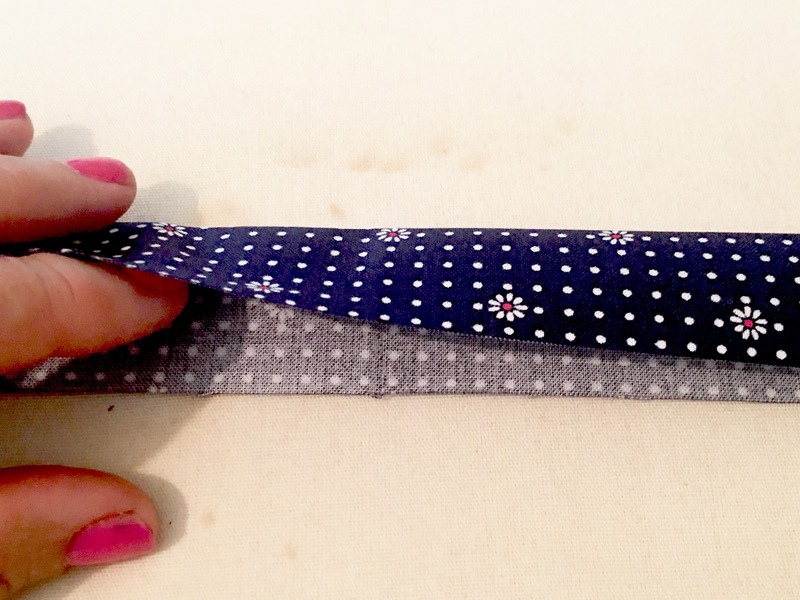 Place your folded fabric strip on the edge with the raw edges together. Leave a 12″ tail at the top. 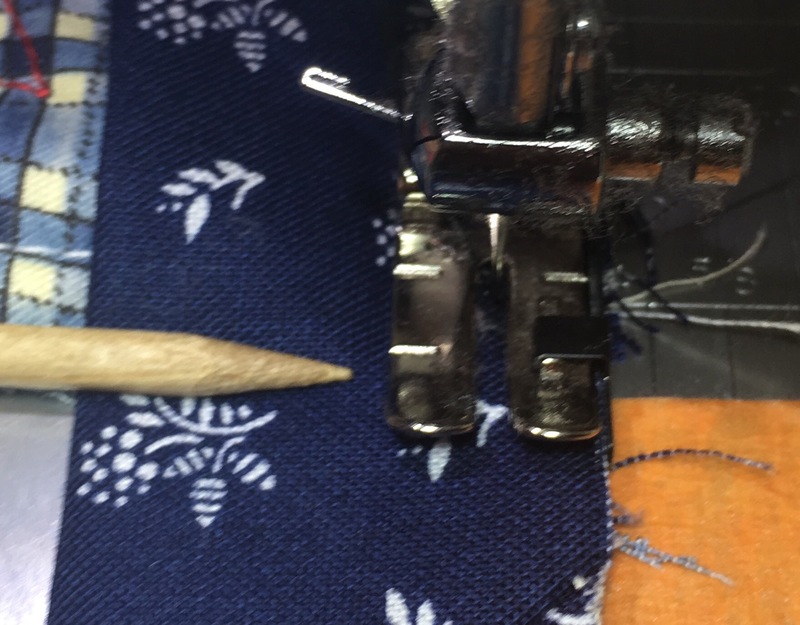 Start sewing with your 1/4″ foot where I have marked with the pin. Sew all the way down the side of the quilt until a little before 1/4″ of the end. Your presser foot should have a 1/4″ mark on it like in the above picture. Stop sewing a little before that mark reaches the edge of your quilt. Place the edge of your quilt on a straight lined surface. I use the edge of my machine. You may need to use your cutting mat if you have a round edged machine. 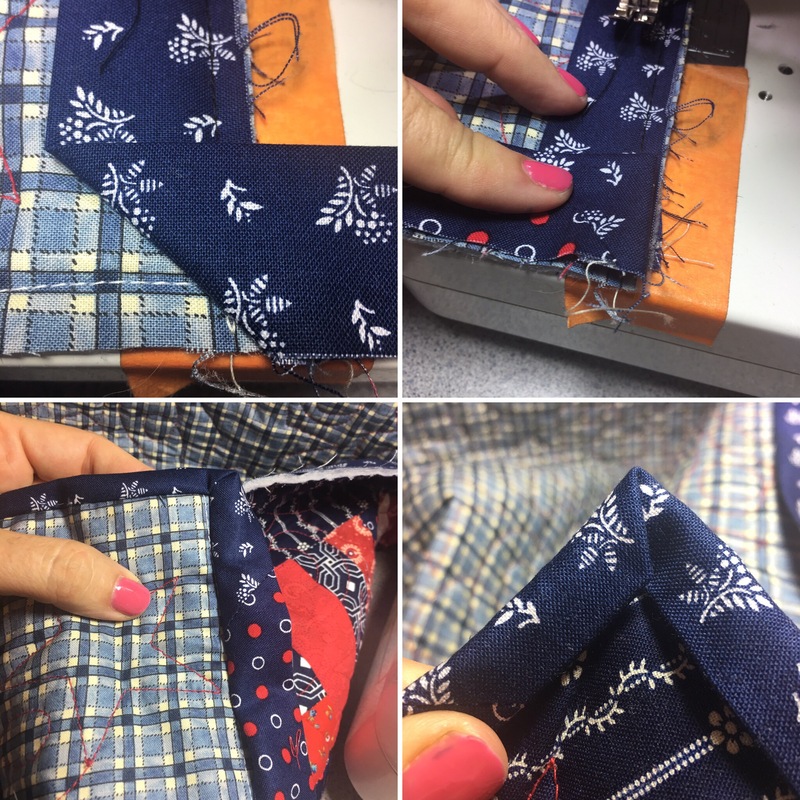 Hold that angled piece as you fold the binding back on itself. Hold it tight and turn it so you can start sewing down the next side. Sew about 3 inches down, cut your threads and check your corner by flipping it over. It should be nice and crisp. If it isn’t, take out the stitching and start again. 3″ isn’t too hard to fix:). 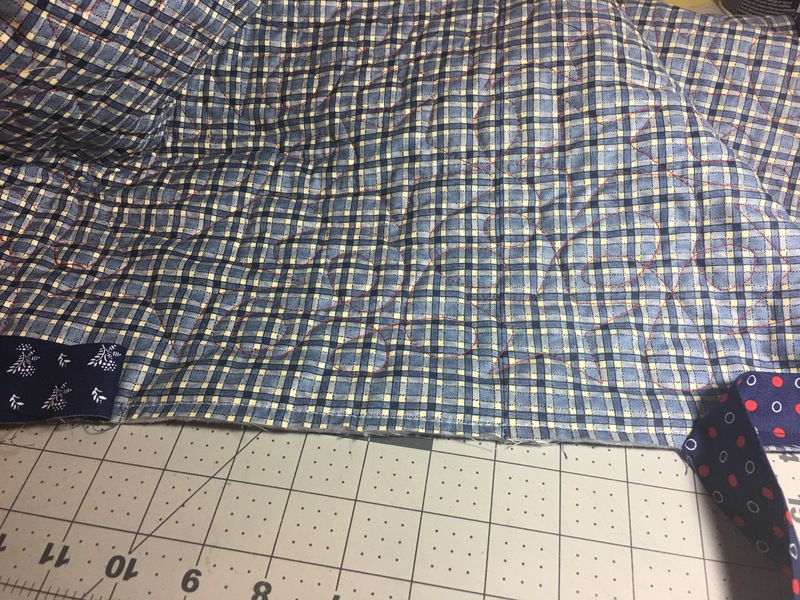 Sew until you are about 12″ away from your beginning stitch. Back stitch and cut your threads. 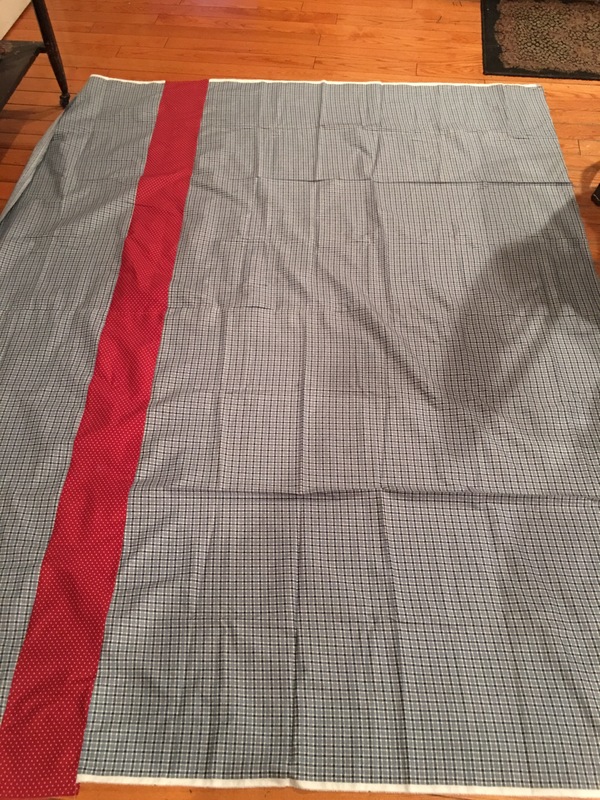 Take your quilt to a large flat surface like your cutting mat. 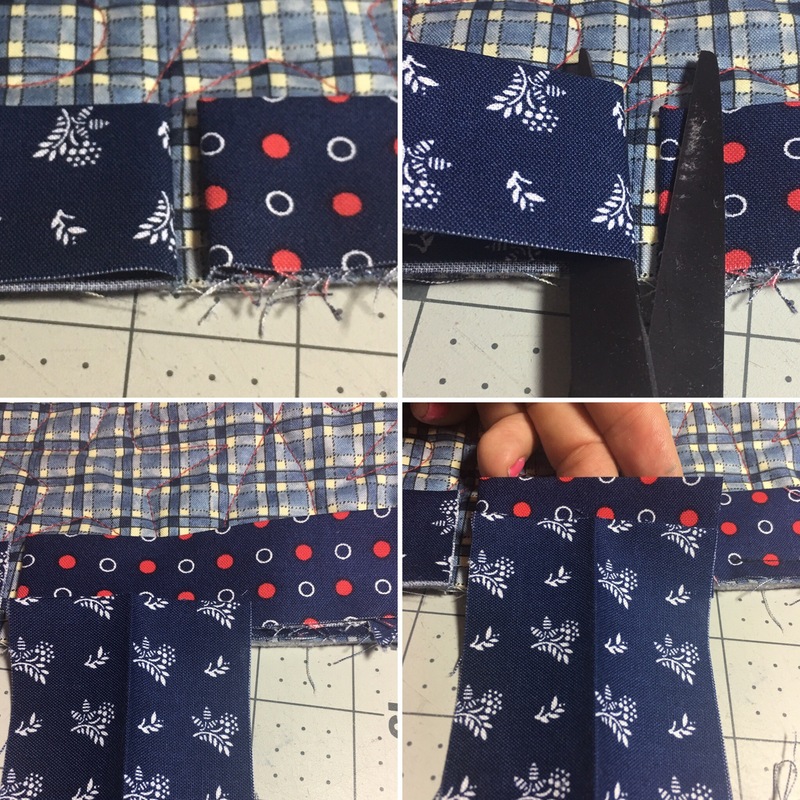 Fold both ends of your binding back on themselves leaving about 1/4″ space between them. Open the piece you just cut and lay it on top of the right piece. Use this as your measurement to cut the top folded part of the right binding. Do not cut through all four pieces of fabric. Only cut the top two pieces leaving a folded piece of binding. Fold the left side of the binding on an angle as in the top left picture. Really finger press that angle. Open the right binding and really hold it there. This next part feels a little awkward, but it’s not too hard, you can do this:)! — while holding the edges together, lift both pieces of binding up and pin them together. 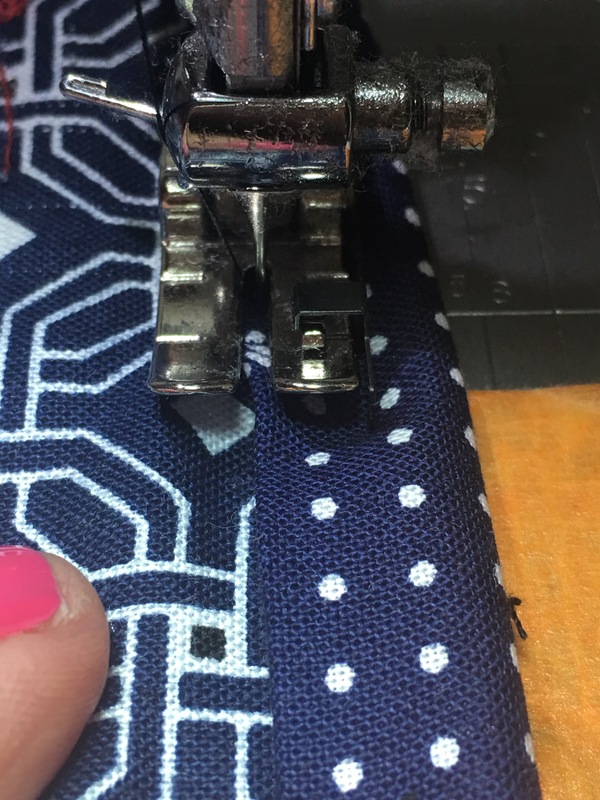 Your quilt will feel heavy, but hold that pinned piece together and bring it back to your machine. Check to make sure your binding now fits your quilt, and then trim the excess corner off with your scissors. 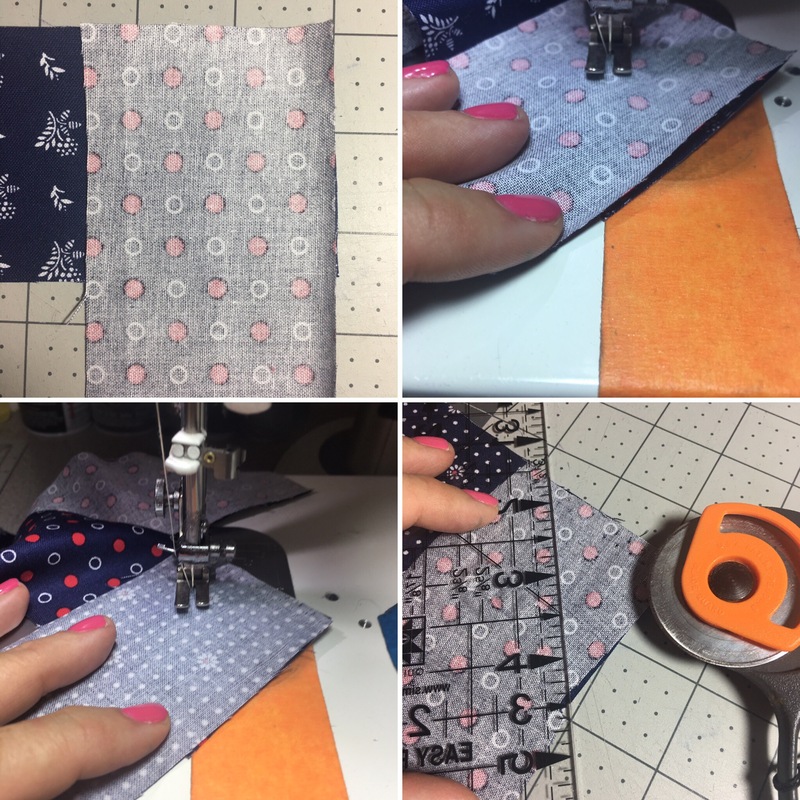 Sew the final 12″ of your binding down to your quilt. Change your threads. The bobbin thread should match your backing fabric and the top thread should match your binding. They might be two different colors. Mine are. 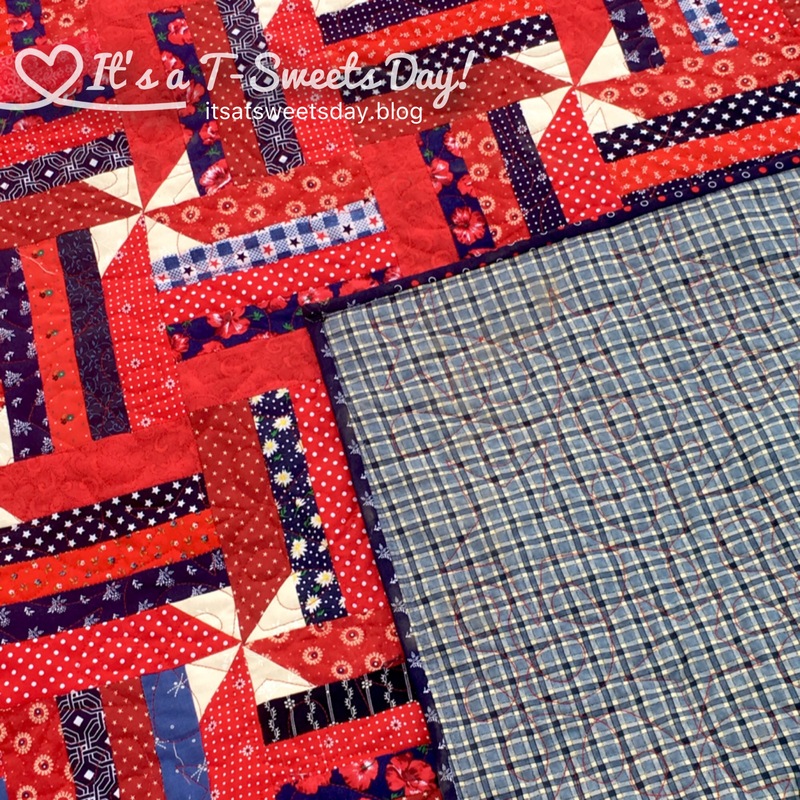 Starting in the middle of one side, fold your binding over to the right side of your quilt. You do not have to fold the entire binding over, just a few inches. Make sure the binding is covering the stitching, and start to sew. Use the left inside edge of your presser foot as the guide for the placement of the edge of your binding. 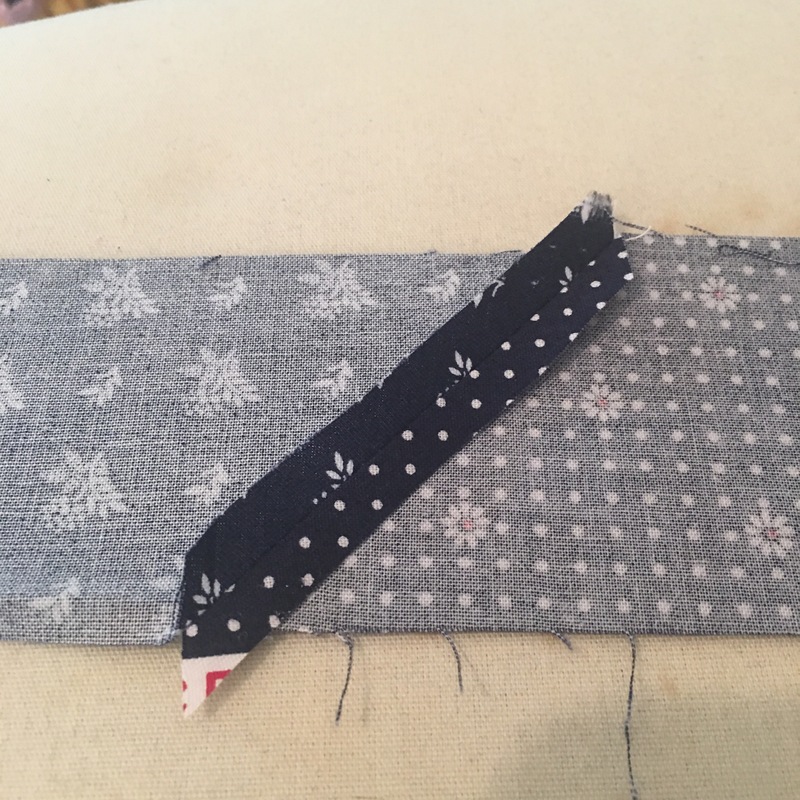 As you sew, the top of the binding will have a cute little edge stitch and the bottom of your quilt will have stitching that blends into the backing fabric. Easy! Sew all the way to the edge of your quilt. Stop right at the edge. Fold the binding up to make a perfect mitered corner. Just look at your pretty corner ! And how simple was that?! 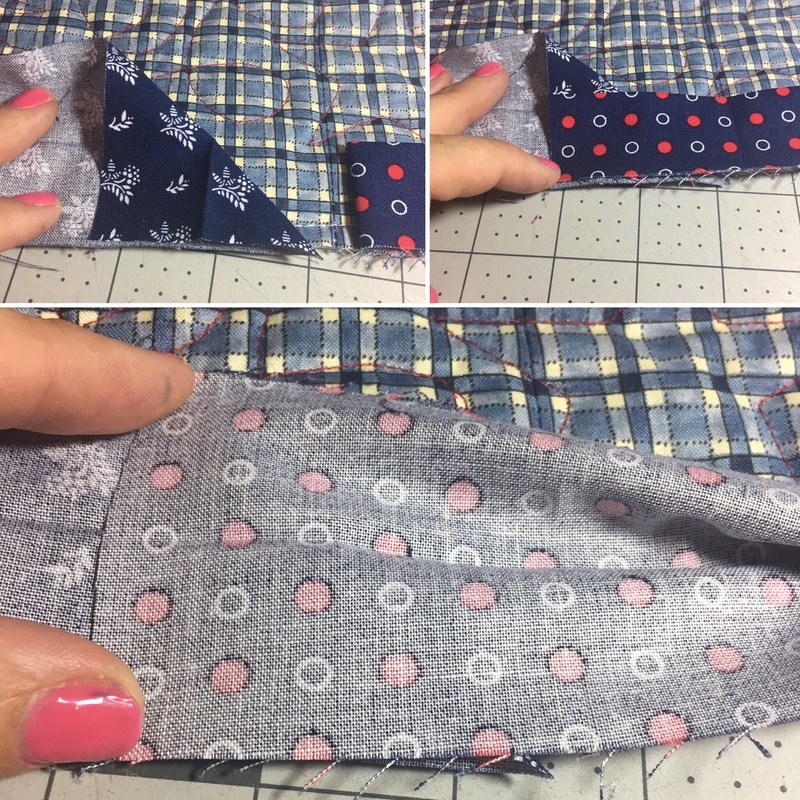 Continue sewing all the way around your quilt repeating the corner technique. DONE!! You have finished your quilt!!! Isn’t it beautiful?! You deserve a fun photo shoot! And how about a picnic? SWEET!! Thank you so much for joining in on this quilting journey. You are now equipped with the necessary tools and skills to make many more quilts. I warn you, quilting is quite addictive:)! I hate to say goodbye to this fun adventure, but I am sure we will sew together again. 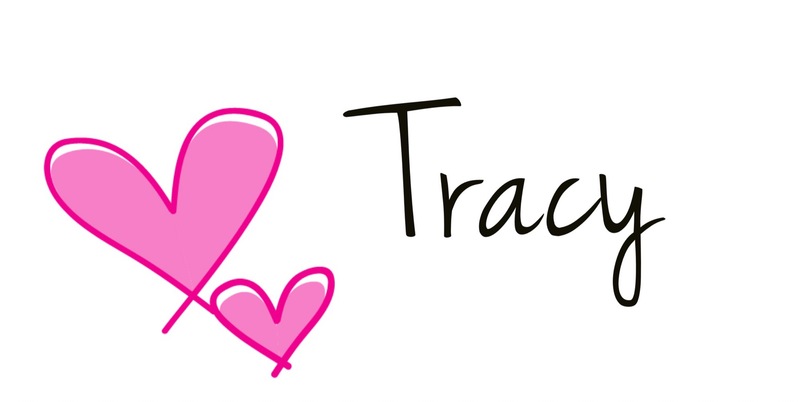 A very nice job with this, Tracy. I hope that lots of people give quilting a try after reading these. Thank you Kathy! There have been quite a few joining in the fun:). 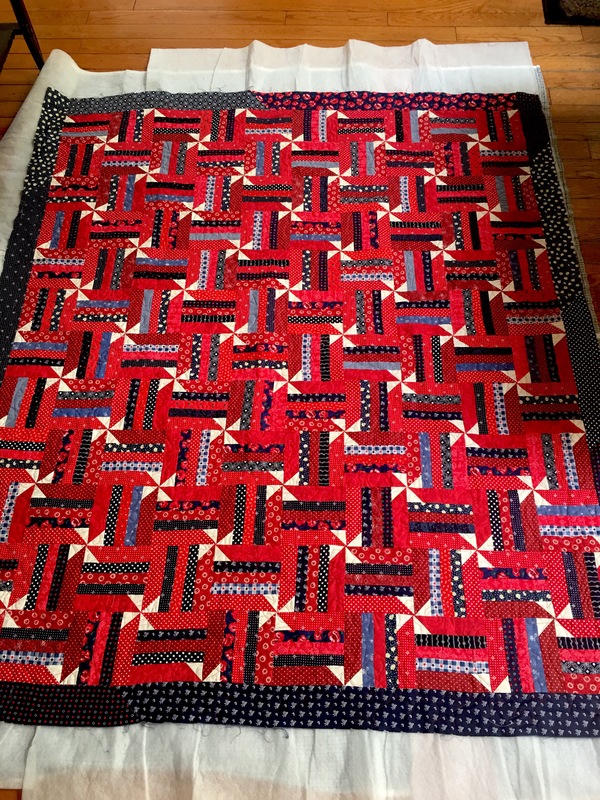 This quilt sure makes it easy! The quilt is just lovely, Tracy. 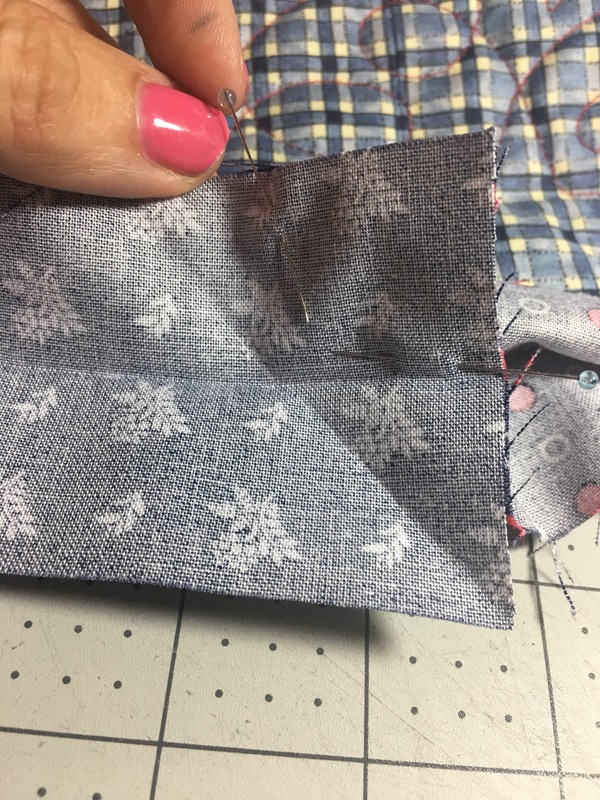 Thanks for sharing the steps, I hope to revisit these posts when I’m finally ready to give quilting a try! Yours is definitely beautiful. 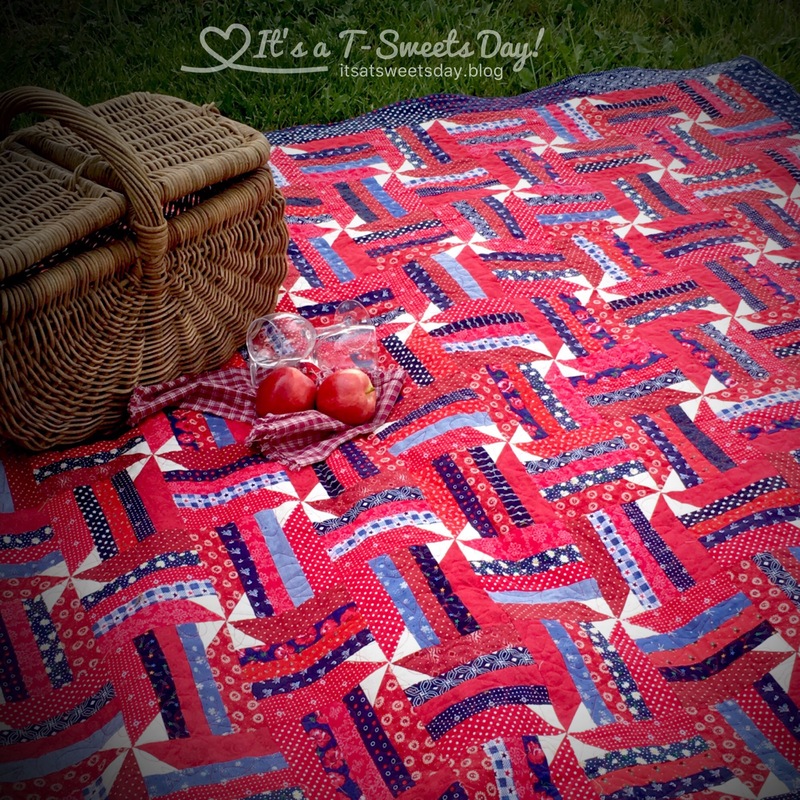 A lovely quilt in just the right colors for July. 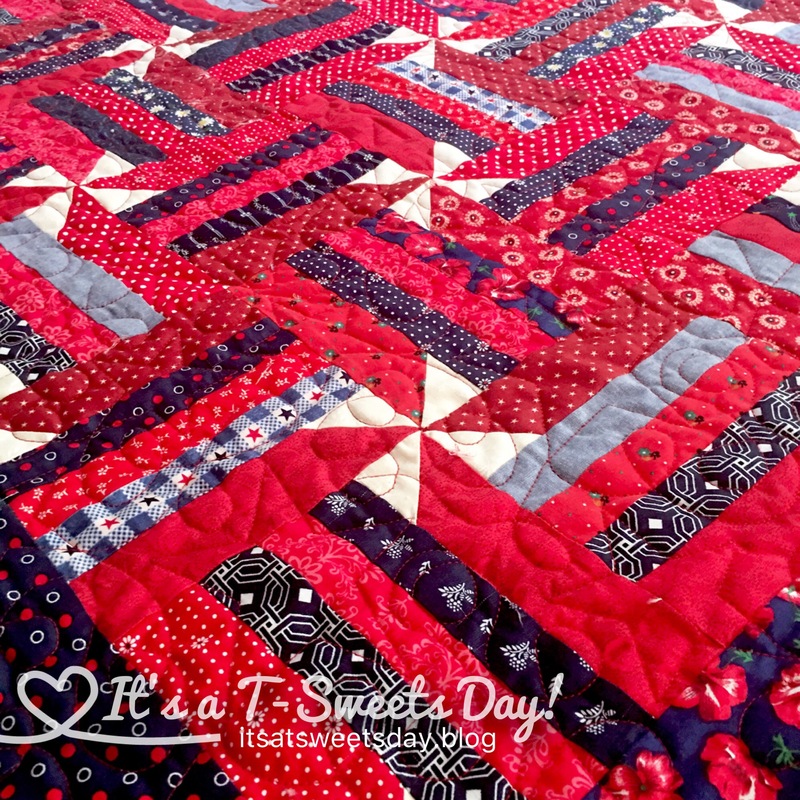 Adorable quilt and this is such a cool series of posts for novice quilters! If I know of anyone wanting to begin quilting I will send them to your blog!